Menu changes for most restaurants are not generally noteworthy; however, when one of the nation’s top diners adds more vegan, vegetarian, gluten-free, and under 600-calorie items, it is significant. While many of Silver Diner’s much-loved classics remain, other items have been replaced with dishes including a delicious Meatless Miso Burger. For all-day breakfast, there are Oaxaca (black bean salsa, pepper jack, salsa roja, cilantro, guacamole); and Baby Spinach, feta and cremini omelets. Brunch specialties include Roasted Veggie Huevos Rancheros with crispy multigrain tortillas, butternut squash, beets, Brussels sprouts, black bean, quinoa, (optional) cage free Amish eggs over easy, peppers, salso roja, scallions, cilantro, (optional) goat cheese and guacamole; and Avocado Toast. Salads include Mediterranean Greek Salad, and a Warm Roasted Local Veggie Salad with beets, squash, brussels sprouts, red peppers, basil, rocket greens, kale, sunflower seeds, pecans, dried apricots in a homemade champagne vinaigrette. There’s a Pineapple Basil Vegan Stirfry; Organic Chickpea Hummus and Veggie Chili. And there are a variety of bowls on the new menu including a Mediterranean Fattoush Bowl with feta cheese, fattoush salad with tahini pomegranate vinaigrette, organic chickpea hummus over harissa yogurt with naan bread; and a breakfast bowl with Icelandic yogurt, locally-made crunchy granola, blueberries, acai, bananas, and hemp. Udi’s Gluten-free bread can be substituted for any sandwich or burger. And, Silver Diner has now added a bar menu with Mimosas and Bloody Marys. Additional new vegan and vegetarian dishes include in-house roasted tomatoes over brown rice with roasted organic corn, mushrooms, leeks, zucchini, pistachios, lemon pesto, asparagus and peach salsa; Brussel sprouts and farro; vegetarian Beyond Meat burgers and $10 Asian brown rice bowl for lunch. 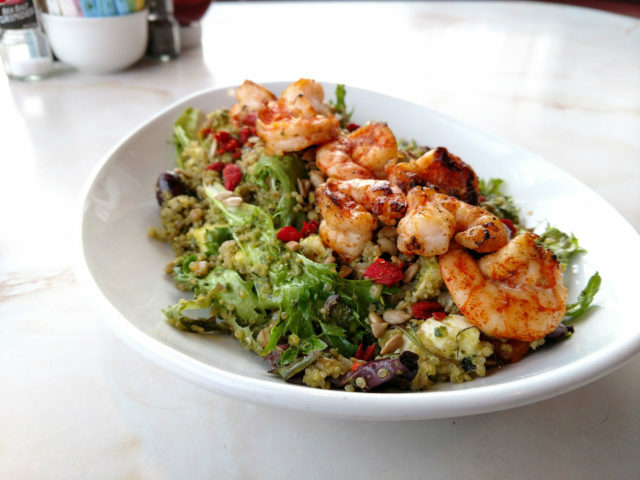 New menu items were rigorously tested with Silver Diner customers over multiple weeks. Those items that made the new menu did so with extremely high customer ratings. Any dishes that did not receive high marks were cut from the menu. “This new menu reflects the largest number of changes in Silver Diner’s menu in 10 years,” said Von Hengst. The menu has been shortened to maintain high-quality standards that include sourcing non-GMO ingredients and all-natural, anti-biotic and hormone-free meats. In Richmond, visit the Silver Diner on West Broad Street near Innsbrook.